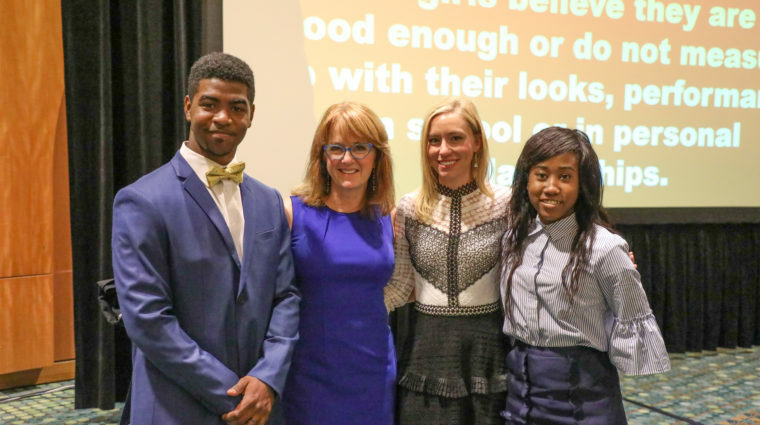 NASHVILLE, Tenn. (April 27, 2018)—More than 1,000 friends and supporters of YWCA Nashville & Middle Tennessee gathered at the Music City Center on Tuesday, April 24 to hear stories of survival, empowerment, and inspiration. Guests donated over $300,000 to the YWCA during the hour-long event. The Spring Breakfast is an annual event that showcases the important work the YWCA does in the community. The Spring Breakfast spotlighted YWCA’s prevention programs, Girls Inc. and AMEND Together. SpeakersJaida Kline, a senior at Hunters Lane High School and Hillsboro High School sophomore Josiah Peek spoke about the positive impacts of these programs have had on their young lives. Lindsey Lance shared her personal story of survival from domestic violence and the support she received from the YWCA to help rebuild her life. All speakers received standing ovations. Ninety individuals stepped up to host tables, bringing friends and supporters to the breakfast. The Belmont Women’s Choir performed “Can’t No Grave Hold My Body Down” to open the Spring Breakfast and “Light of a Clear Blue Morning” to close the event. Nissan, LP Building Products, and HCA/TriStar Health provided generous corporate support. For 120 years, YWCA Nashville & Middle Tennessee has helped women, girls and families in Nashville and Middle Tennessee build safer, more self-sufficient lives. YWCA is dedicated to eliminating racism, empowering women and promoting peace, justice, freedom and dignity for all. Programs include Domestic Violence Services, Girls Inc., MEND, j k livin, Dress for Success and the Family Literacy Center. For more information, visit www.ywcanashville.com, follow us on twitter @YWCANashville and find us on Facebook facebook.com/YWCANashville. The YWCA’s 24-Hour Crisis & Support Helpline is 1-800-334-4628.